13 HAND-SEWN STARS, IN AN OVAL VERSION OF THE 3RD MARYLAND PATTERN, ON AN ANTIQUE AMERICAN FLAG MADE IN THE PERIOD BETWEEN THE CIVIL WAR (1861-65) AND THE 1876 CENTENNIAL OF AMERICAN INDEPENDENCE: 13 star flags have been flown throughout our nation’s history for a variety of purposes. They were hoisted at patriotic events, including Lafayette’s visit in 1824-25, the celebration of the centennial of American independence in 1876, and the sesquicentennial in 1926. They were displayed during the Civil War, to reference past struggles for American liberty and victory over oppression, and were used by 19th century politicians while campaigning for the same reason. As the number of stars grew with the addition of new states, it became more and more difficult to fit their full complement on a small flag. The stars would, by necessity, have to become smaller, which made it more and more difficult to view them from a distance as individual objects. The fear was that too many of them close together would become as one white mass and distort the ability to identify American ships on the open seas. Keeping the count low allowed for better visibility. For this reason the U.S. Navy flew 13 star flags on small boats. Some private ship owners mirrored this practice and flew 13 star flags during the same period as the Navy. Flag experts disagree about the precisely when the Navy began to revert to 13 stars and other low counts. Some feel that the use of 13 star flags never stopped, which seems to be supported by depictions of ships in period artwork. This was, of course, the original number of stars on the first American national flag, by way of the First Flag Act of 1777, and equal to the number of original colonies that became states. Any American flag that has previously been official remains so according to the flag acts, so it remains perfectly acceptable to fly 13 star flags today by way of congressional law. Since there was no official star configuration until the 20th century (1912 specifically, beginning with the 48 star count), the stars on 13 star flags may appear in any one of a host of configurations. Some of these are more rare and desirable than others. The stars of this particular flag are arranged in a circular wreath of 12 with a single star in the center. This basic configuration, whether oval or circular, has come to be known as the "3rd Maryland Pattern". The design is very desirable due to both its visual attractiveness and the scarcity of its use. The name comes from a flag that resides at the Maryland State Capitol in Annapolis, long thought to have been present with General Daniel Morgan at the Battle of Cowpens in 1781. According to legend, the flag was supposed to have been carried by Color Sergeant William Batchelor of the Maryland Light Infantry and was donated to the State of Maryland by Batchelor's descendants. The story was disproved in the 1970's, however, following an examination by the late flag expert Grace Rogers Cooper of the Smithsonian. She discovered that the Cowpens flag was, at the earliest, of Mexican War vintage (1846-48). Among flag collectors and enthusiasts, the name "3rd Maryland" stuck to the design. The term actually received some legitimacy through the existence of a similar flag, in the collection of the Smithsonian’s National Museum of History & Technology, with verified Maryland provenance. This was carried by the Maryland and District of Columbia Battalion of Volunteers during the Mexican War. While the configuration is known to be an early one, as evidenced by 18th century illustrations, this star pattern is most often encountered among surviving examples that date to the mid-19th century, roughly within the Mexican War to Civil War time frame (1846-1865). For some reason it seems to have not been particularly popular at the time of our nation's 100-year anniversary in 1876, but some examples of that period are known in the 3rd Maryland design. It was also revived in small scale, commercially-produced flags, such as this one, during the 1890-1920's time frame. This particular flag was made sometime during the Civil War and the centennial era. Its hand-sewn stars, presented in a wide oval, tip this way and that on their vertical axis and have wonderful visual qualities, both as a group and individually. Pieced from two lengths of wool bunting with hand-stitching, the blue canton is hand-stitched to the striped field. The stripes are made of wool bunting and are joined with treadle stitching, which is common from the Civil War onward. There is a plain-weave, heavy cotton binding along the hoist, applied with hand-stitching, at the top and bottom of which are two hand-sewn, whip-stitched grommets. While the flag may seem very large to the casual observer, at just under 4 feet on the hoist by just over 7 feet on the fly, the flag is on the smaller side of average for the period in which it was made. Prior to 1890, flags with pieced-and-sewn construction were generally 8 feet long and larger. Garrison flags measured between 35 and 45 feet in length. Even Union Infantry battle flags, carried on foot, were 6 x 6.5 feet. Because their function was to provide identification as signals from a distance, flags needed to be much larger in scale than they are today. With the exception of small printed flags, called parade flags or hand-wavers, even decorative flags tended to be much larger than one might expect. Due to a combination of its star pattern, scale, bold colors and hand-sewn elements, as well as its pleasing proportions, this is a beautiful example among 13 star flags of the mid-latter 19th century. Mounting: The flag was mounted and framed within our own conservation department, which is led by expert staff. We take great care in the mounting and preservation of flags and have framed thousands of examples. The background is 100% cotton twill, black in color. The mount was placed in a black-painted, hand-gilded and distressed Italian molding. The glazing is U.V. protective plexiglass. Feel free to inquire for more details. Condition: There is minor mothing throughout and there is extremely minor staining, but there are no serious condition issues. Many of my clients prefer early flags to show their age gracefully. 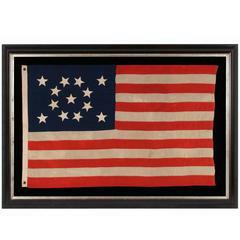 Frame Size (H x L): 58" x 100.75" Flag Size (H x L): 46" x 88.5" About Jeff R. Bridgman Antiques, Inc.: As an advisor to top museums and collectors alike, Jeff Bridgman is the world's leading expert and source for antique American flags and political textiles. In this field there are many fakes, forgeries, and misrepresented items, and there is no substitute for experience. As the nation's leading buyer and seller, Jeff R, Bridgman Antiques, Inc. has handled more material than anyone in the field. He has also operated a textile conservation business for 18 years, where expert staff have conservation mounted, framed and restored thousands of examples, more than anyone world-wide.